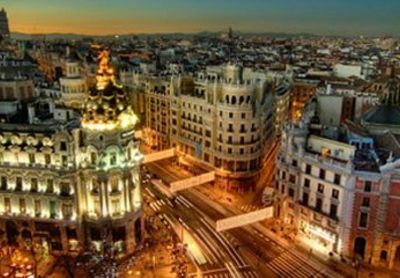 Spain\'s capital and biggest city is home to 3.3 million people, and nearly the same again in the greater metropolitan area. Just northeast of the centrepoint of the Iberian Peninsula, Madrid is hot and dry in the summer, with year-round sunshine. The milder Spring and Autumn are ideal times to visit, as there is much to see and do on foot. As the monarchical seat of power, Madrid has a magnificent Royal Palace and plenty of medieval architecture alongside modernist buildings serving the frenetic pace of life here. Cosmopolitan, gay-friendly, and commercially-driven, Madrid sits alongside Berlin, London and Paris as one of the great progressive cities of Europe, and, with its typical 8-10 hour working day perhaps shares more in common with its continental counterparts than the more laid-back, siesta-observing cities elsewhere in Spain. Most tourists\' first port of call is the Puerta del Sol, the plaza and beating heart of Madrid. Street performers, political demonstrations, and pickpockets – anything you\'d find in Oxford Circus, basically. It\'s far from the only public space. Madrid is replete with such squares, like the Plaza Mayor, which has been the venue for everything from bullfights to symphonies and public executions. The Plaza de la Villa is another highlight, and was the main square in Madrid during the Middle Ages. The real joy of the city lies in strolling between these Plazas until the sun goes down, before heading for a well-earned cerveza and tapas, but be sure to visit at least a few of the city\'s many museums. The Museo de America exhibits thousands of artefacts from pre-colonial times in what is now Latin America, as well as items from the Spanish conquest. Most of the information plaques are in Spanish only, so you might want to take a translation book or friend! There is a wealth of art galleries boasting some of the world\'s most highly-regarded works (including Picasso\'s Guernica) and regal homes open to the public, and football fans will not want to miss the spectacular Bernabeu stadium, home ground of Real Madrid. But as you\'ll discover, these cultural heavyweights are not really what Madrid is about. Getting to grips with the lifestyle of the madrilenos involves simply hanging out in the cafes and terrazas, and fighting your way through the Sunday Rastro market. Madrid\'s traffic system is complex and requires careful planning to negotiate if you\'ve never been. Once you get to the airport, rent a car from GoCarRental.com so you can travel in and make day trips out of the city. But getting around the city itself is best done on foot and public transport, as congestion is a major problem during rush hours and vacation periods, roadworks are seemingly endless and parking in the city centre is a minor nightmare.